There’s not an earthly “fort” that could be occupied that can hold the riches of his grace, glory, and mercy! They are unsurpassed! There’s a ridiculous movement going on today inspired by nefarious catalysts and rabble-rousers. 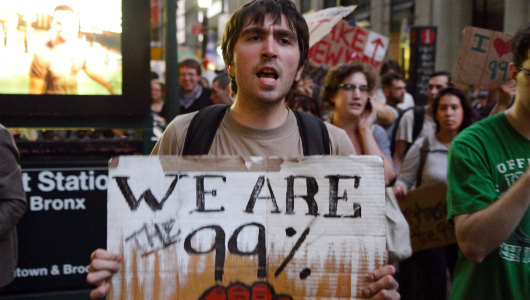 The “Occupy” people are everywhere, and from what we see in the media, they’re most successful occupying the blogs and the mouths of the Talking Heads. It’s all about the have’s and the have not’s. In case you need to know this, they’re the have not’s, and they’re out to get the “1 percent,” who are inexplicably unwilling to share their riches. Well, I have an answer for these people: You want riches, Occupy God’s Word (OGW)! Here’s how to get rich quick. No gimmicks. No 6-DVD sets and an all-day seminar. Really, there’s not an earthly “fort” that could be occupied that can hold the riches of his grace, glory, and mercy! They are unsurpassed! They are unfathomable! (read Ephesians basically!) And they are literally at our fingertips. Sounds like an admonition to be occupied, not to occupy anything. This entry was posted in Commentary and tagged 1 percent, 99 percent, Bible, God's word, occupy, Occupy Wall Street, OWS, rich, riches, wisdom. Bookmark the permalink.